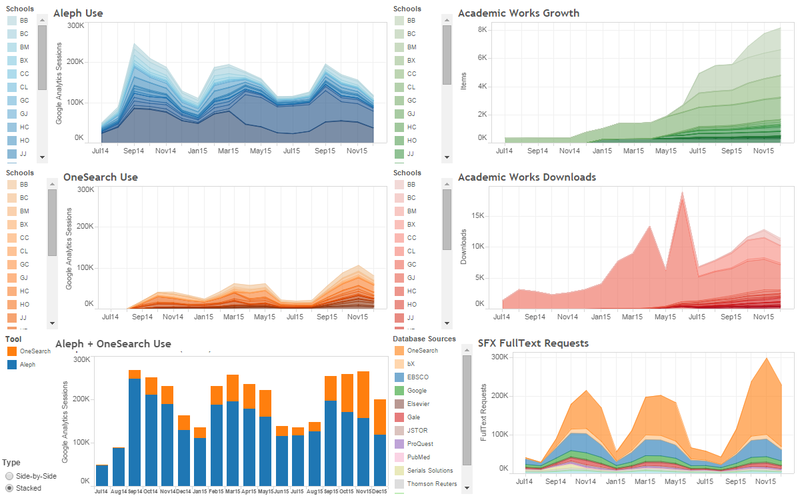 Information about the source data for each of the graphs is displayed at the bottom of the individual graph page, not on the overview/dashboard page. Click on a legend point in any of the graphs. This will offer a popup window with 2 options: “Keep Only” and “Exclude.” Selecting one of these options will filter the information only in this single graph, changing it to display only the selected data. Note, however, that the static 0-300K vertical axis makes it difficult to see individual school data. There is an “Undo” option at the bottom-left of the page to remove a single filter action. Use the “Reset” option to remove multiple filtering steps at once. Double-click on any graph to zoom in on the data. Once that is done, a “Home” button appears to take you back to the original view. The “Undo” and “Reset” buttons also work on these changes. A few weeks ago, we (OLS staff) discussed ways in which the impact of Primo on other systems and environments could be illustrated. A good place to start with is SFX, since it’s so heavily involved in creating fulltext links in Primo. So one way to measure Primo’s impact on SFX is to count the number of OpenURLs generated by Primo (either through “View Online”, or through the menu under “Other Options”) and compare them to other providers/generators of OpenURLs. 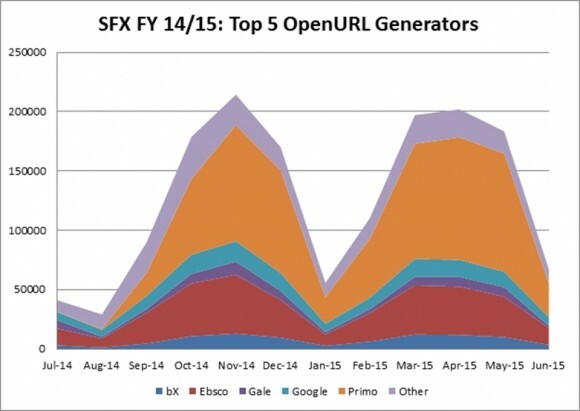 So it looks as if Primo has taken over a large share of the OpenURL requests, but not so much by taking them “away” from other providers but by simply increasing the number of OpenURLs. The total number of SFX requests for FY13/14 was about 1.1 million (1,107,169). In the past FY, this increased by almost 40% to 1.5 million (1,538,333). And of these, 670K (669661) came from Primo. In addition I learned that the titles from Scribner Writers Online and Twayne’s Authors Online [XLS] were also included in the KBART report and they are also part of the GALEGROUP_DB_VIRTUAL_REFERENCE_LIBRARY target. So any of the title we license from these two collections would have been activated as well. While these titles are active in SFX now, they won’t be updated in OneSearch until new Google Scholar holdings are created. I will take care of this by Friday.